Christelle and Christophe were looking to give a new meaning to their life. They wanted to find a calm and authentic place where they would share their values and ethics with others and raise their children. During a trip to Charente-Maritime, they fell in love with Saintes, with the beauty of its landscapes, the richness of its history but above all the peacefulness of its inhabitants. From this atypical and yet coherent journey is born Paus’Ethique Home, an ethical bed & breakfast. Christelle and Christophe have created a place that represents them: authentic, full of meaning and which reflects their shared vision of ethics and education. Christophe has bought back from his 15 years of life in French Polynesia a true sense of hospitality. Meanwhile, during his career in the luxury hotel and real estate industries, he has developed a true skill for renovation and interior design. Christelle – Owner of a history of art and interior design degree, Christelle is also trained to environmental psychology. As an interior designer, she has specialised in the selection of furniture and the conduct of spatial planning projects which respect both the environment and the human being. Always benevolent and attentive to individual needs, she helps her clients, both professionals and private individuals, to conduct their indoor and outdoor design projects. Besides, Christelle has followed several training courses to alternative educational methods (Montessori, Stern,…) which have enriched how she envisioned the spaces dedicated to children. This knowledge also daily nourishes her creative and benevolent pedagogical approach. But its is the numerous suggestions given by guests during the renovation of the estate or the development of its main activities, that have enabled to successfully blend these complementary approaches. 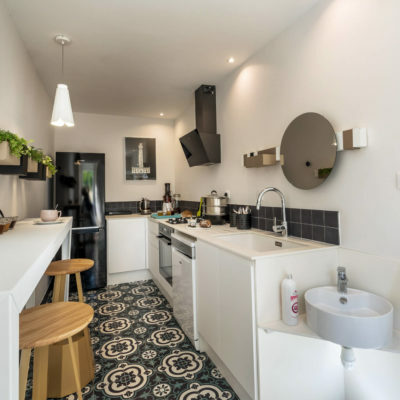 Christophe and Christelle have thought about each detail of their house to give their guests the warmest welcome, in an environment in which the word ethics would really make sense. From the breakfast to the shower head everything has been designed to respect the environment and allow hosts to relax and awaken their senses. This 17th century farmhouse has been restored and decorated to awaken your senses and sensations. 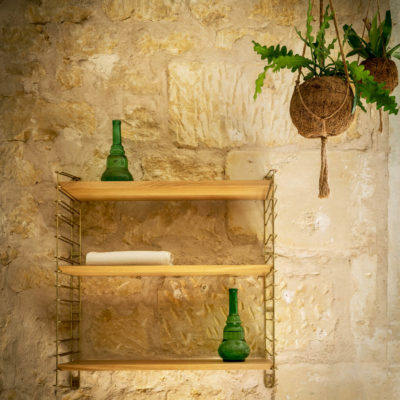 Each piece of furniture is the art of a craftsman (either 100% french or from different cultures) and respects both the human being and the environment. Our guests can find this “design to be experienced” spirit in our concept store and bring back home the traditional crafts and the sustainable approach by which they were charmed. Christelle and Christophe also offer workshops for all, to enhance one’s free expression skills, creativity, wellness, parent-child relationships, communication and sensual awareness. A unique opportunity to enjoy yourself but also to share your experiences with other guests. Having always been attentive to children’s wellbeing and education, Christelle and Christophe have chosen to make children their special guests. They have dedicated spaces for them, offer cradles made from noble and safe materials and for a customized parent-baby experience, layout rooms in a Montessori manner. 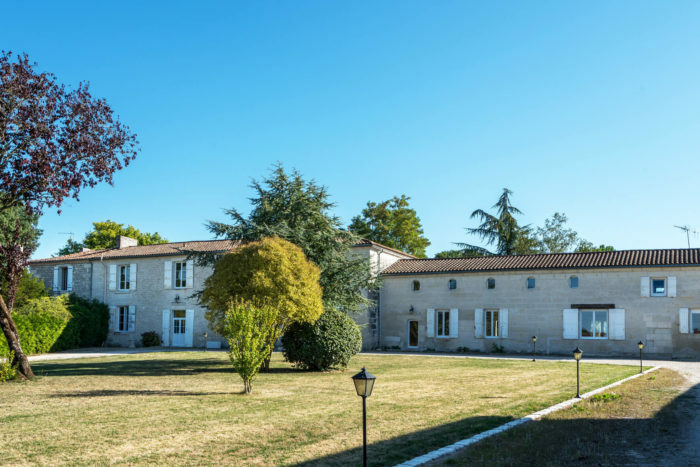 Imagine, an ethical B&B in a 17th century farmhouse, surrounded by 4 hectares of nature and peace, at the heart of the Saintonge region and less than 8 minutes from the historic centre of Saintes. 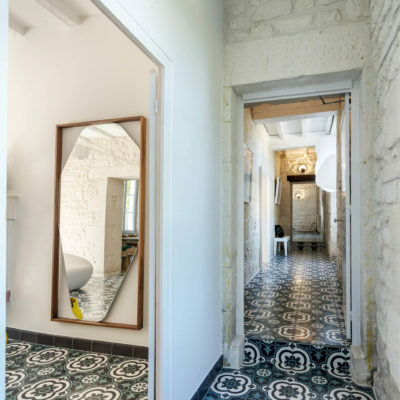 The ethical and authentic soul of this 240m2 ancestral farmhouse transpires in all communal spaces (living room, dining room, kitchen): amongst the stone walls and the ancient fireplaces, design and vintage playfully and poetically mingle. 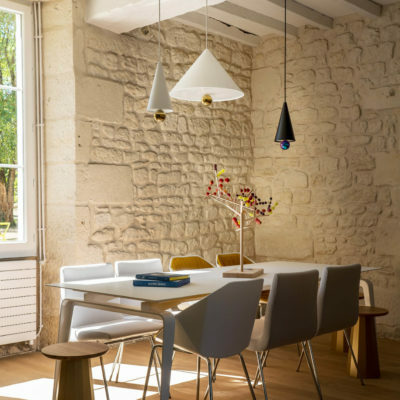 In these common spaces, entirely refurbished by Christophe and local craftsmen, Christelle made sure that the room layout would let positive energy flow and each person, whether adult or child, find their place. Art is also omnipresent, particularly in a long corridor dedicated to the work of Anne Lesca, a plastic artist of the region. The poetry of her work resonates perfectly with the one expressed in the layout of the house. Relax and unwind in our beautiful south facing garden. Depending on the season, children may see 2 to 5 equidae walking around the estate. 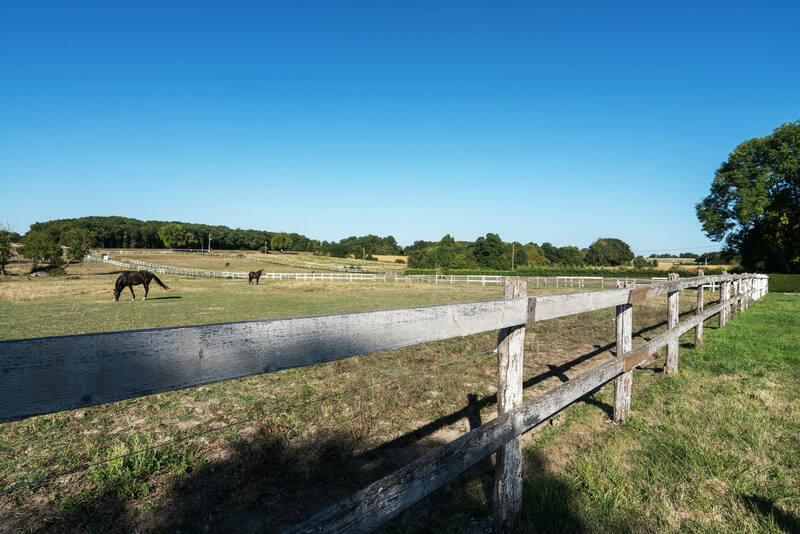 For those who want to discover the joy of horseriding, the neighbouring horseriding club, at walking distance through the woods, offers horseriding tours for children (supervised by their parents). The B&B is only 8 minutes from the historic centre of Saintes, a city of Art and History dating from the gallo-roman times. Enjoy its landscapes, monuments and savoury cuisine. 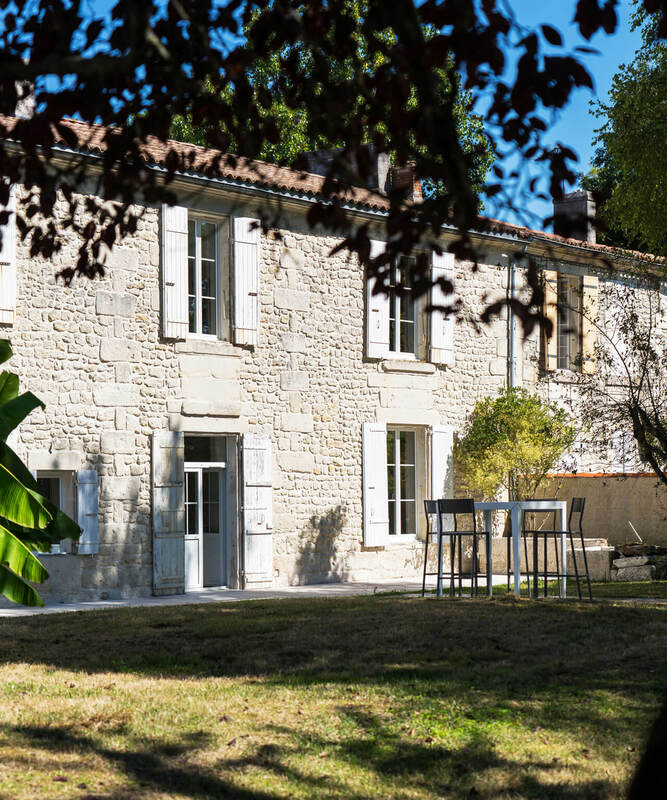 Follow the soothing flow of the Charentes and its magnificent valley. Let yourself bewildered by the change of scenery and dive directly into the authenticity and history of a flamboyant city. Discover the region’s rich history and hidden treasures: its everchanging landscapes, its castles, its historic sites and villages certified “most beautiful villages in France”. Spend a day by the Atlantic Ocean, at only a 30 min drive. Sunbathe on the beaches of Royan, stroll in its surroundings or meander in the streets of the city of Cognac. Up for travelling further away? Visit l’ile d’Oleron, l’ile de Ré, La Rochelle or Angoulème, all at less than 1 hour drive. Reach the region of Gironde and its capital, Bordeaux, in less than 1h15.